DigiLink :: Acces T1. If you are looking for a high bandwidth circuit with the ability to move data at speeds up to 1.5 megabits per second (for both uploads and downloads simultaneously), yet your distance from our points of presence make a Point to Point T1 cost prohibitive, our Access T1 solution may be the perfect solution. If you are looking for a high bandwidth circuit with the ability to move data at speeds up to 1.5 megabits per second (for both uploads and downloads simultaneously), yet your distance from our points of presence make a Point to Point T1 cost prohibitive, our Access T1 solution may be the perfect solution. With an Access T1, as the data moves through the cloud, it is subject to reductions in maximum throughput. However, moving the data through the cloud lessens the tight requirements with regard to distance, both from your premises to the CO, as well as from your premises to the locations where DigiLink maintains a point of presence. Therefore, the pricing of the circuit is not distance sensitive, and we are sometimes able to offer an Access T1 in locations where we would not be able to offer a Point-to-Point T1. The amount of maximum throughput reduction varies from moment to moment, depending upon the saturation levels of the telco cloud at that instant in time. Typically throughput levels on an Access T1 rarely drop below 512 kbps, and are often closer to the full 1.5 mbps. For many customers, cloud saturation is not even noticeable, as they very rarely saturate their link with typical usage. The purple circles represent customer networks. In this architecture, data moves from each customer's network to a central network "cloud", where it passes to DigiLink's network via a single high-bandwidth connection, together with data from the other customers' networks. Even though this connection is shared, each customer's data maintains its integrity. The local loop (or "last mile") of most circuits is provided by your local telephone company. Fortunately, when you procure your services from DigiLink, you don't get stuck having to deal with the phone company. We will procure services from them on your behalf, and supervise the installation. Should a problem arise with your local loop, we deal with the phone company on your behalf. It is important to note that the phone company holds itself to different standards of responsiveness depending upon the circuit type. DSL service is considered by the major telecommunications companies to be a low-end residential class service, and as such, they generally make few guarantees about how quickly they will respond to problems with DSL loops. On the other hand, T1 circuits are treated as mission critical business services, and outages are responded to relatively quickly (typically within a couple of business hours). 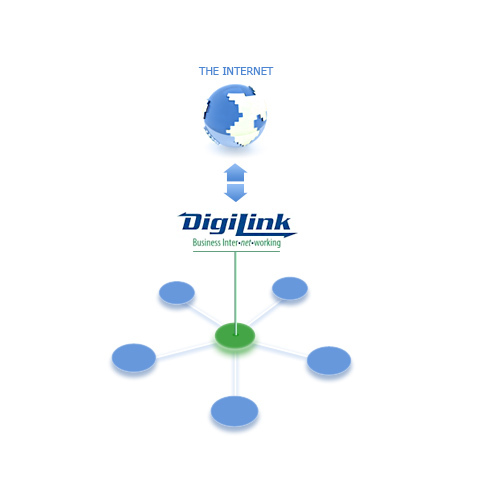 Get the reliability of a T1 circuit, with high data throughput, and the service you can only get from DigiLink. As with all our services, this service includes free web or ftp space, to allow you to host your company's web site and mail services in the same package. Installation times typically within 10 business days. Prices vary, depending upon your location. Get a quote.